Kally Sleep collaborated with Dr Rick Hussein to gain vital insights into the lives of those who suffer from poor sleep. Find out more sleep advice from Dr Rick Hussein and the common complaints he often comes across in his practice. 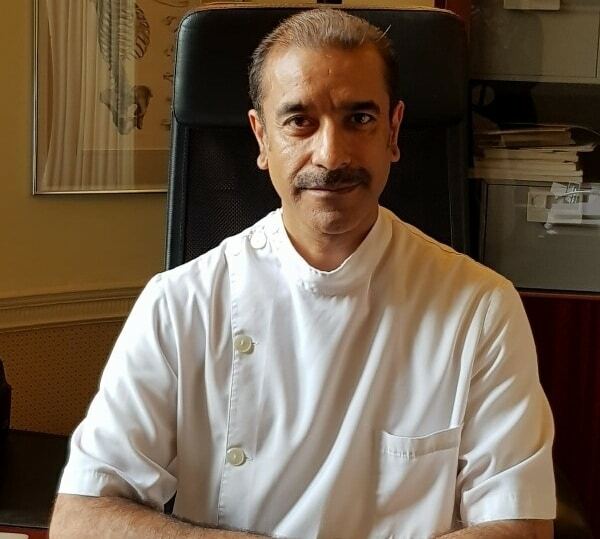 How long have you been working as an osteopath in the Harley Street area? What are some of the most common sleep related complaints you receive from patients? Using the wrong pillow, or not using the pillow correctly, can cause neck and shoulder trouble. This can manifest as headaches, jaw pain, tiredness, nerve irritation, pins and needles/numbness in the arms, etc. Sleeping prone (on ones front) often causes neck and lower back trouble. Humans have a subconscious need to ‘protect’ the front of our bodies and some might feel comforted by sleeping on their tummy. As a solution, I have suggested to innumerable ‘tummy sleepers’ to try sleeping on the side and hug (with arm and leg) onto a pillow or bolster which gives a very similar sense of comfort as sleeping on the front. What is your best advice to people who suffer from these symptoms? I advise patients to sleep side-lying on a medium firm mattress using a medium firm pillow which is dense but malleable so that it can be tucked right down into the neck to the top of the shoulder. This way the whole neck is supported and the shoulder is prevented from shrugging up. People commonly use pillows for the head only leaving a space under the neck … a good pillow well positioned should support the head but more importantly the whole of the neck. In your opinion, how many hours should the average person sleep per night? This is variable depending on factors such as, general health, mental health, genetics, age, etc but generally speaking 7 hours should be sufficient for an adult. The average Briton sleeps 6.5 hours but it seems that some of the most successful/influential people in world have survived on much less … President Obama on 4-5 hours, Margret Thatcher on 4 hours a night! Are there any best practices you can recommend to people who suffer from poor sleep? Regular daily exercises will help regulate sleep. Reducing intake of stimulants such as caffeine, alcohol and refined sugars after lunch. Going to the same bed at a similar time, i.e. creating a regular routine. Creating a calming and comfortable environment, i.e. dim the lights, reduce noise, get rid of all distraction such as computers and mobile phones and substitute with soft music, a hypnosis tape or a boring book! Also research has shown that reducing the temperature of the room to 15 – 19 degrees is conducive to sleep. If you are still having difficulty sleeping after 15-20 mins try turning over the pillow as the refreshing under side often helps. Otherwise get up and do something else for a few minutes rather then just lying in bed a counting tens of thousands of sheep! How integral is a good nights sleep to our every day health? Good quality sleep is absolutely integral to our well-being. Sleep regulates the Circadian Cycle (the bodies inner clock), helps us maintain correct metabolic function that governs our immune system, blood pressure, hormonal balance, weight, etc. The brain processes our thoughts and memories during sleep and research suggests that attention focused activities are impaired with sleep deprivation.